This is a two light setup of a rose I bought Leanne last week and some of the greenery that decorated the rose. 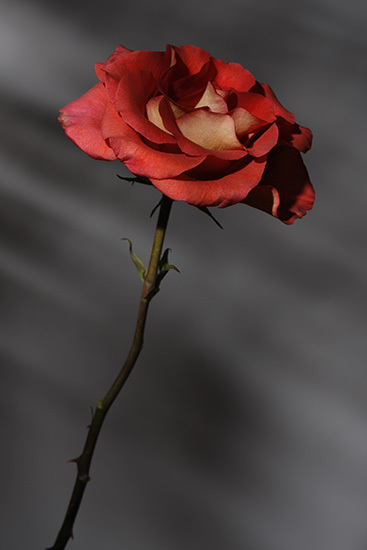 For this photo I used one flash (about 1/16 power) to the right of the rose about 3 feet away to provide lighting on the rose. I used a second flash (also about 1/16 power) fired through the leaves of the fern directing the shadow on the background. This setup was about 6 feet away from the wall. Neither light affected the other. The light on the flower did not spill over to the wall, and the light for the background shapes did not spill on to the flower. Using this simple setup and a variety of gobo's (which is what the fern acted as in this case) would provide unlimited possibilities for this one simple setup.